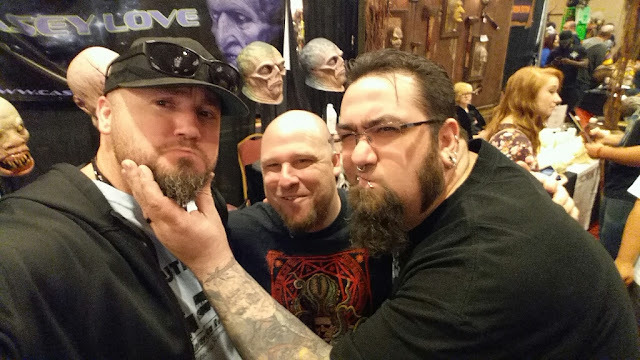 I’m a few days late with this, but Mask-Fest 2015 has come and gone and I’d like to state for the record that AAAAAGGGGHHH, which translates roughly as “That one went by faster than ever”. In what felt like the blink of Blink’s big bloodshot eye, an amazing weekend of monsters ran right over us all like a zombie fullback shot full of amphetamines. And it was probably the best Mask-Fest yet. The variety of masks and props on view was simply staggering (or maybe that was Carlos). This year I saw so many new, innovative masks from new artists and new companies, it was enough to make Linda Blair’s head spin. People like Eric Austin, Nathan Hanneman, Daniel Roebuck, Ed Edmunds, Jordu Schell, Paul Daniels, Carlos Marquez, Connor Deless, Brian Mattingly, Pete Infelise, Justin Mabry, Casey Love, Sluggo Gonzales, Sigmund Zoid, John Lauritzen, Mortimer VanCreep, Dr. Tarr, Professor Fether, William Cowan, Elliot Britz, AJ Good, Pat Scarangella, Dirk Smith, Caleb Oglesby, Greg Duffy, Mikey Rotella, Monte Ward, John Lovell, Rhonda Underwood, as well as my own regular gang of ghoulies including Kellie Hamilton, Chris Striker, Zack Lazza, Jakhob Clady, Jordan Clady, Wolfie and his fleas, The Professor and Mary Ann and others too humorous to mention are the REAL main ingredients in a wonderful, memorable event. I know from my own wacky projects that organizing any special event involves far more complications and background details than could be realized by any casual observer, making the whole thing even more impressive to me. Despite the brain-blasting array of monsters and monster art, the very best part of the event was once again the opportunity to hang out (however briefly) with so many wonderfully creative, fun, delightful human friends. I say this every year, but one three-day weekend is simply not enough for me. I need to have a Mask-Fest that parties on for at least a week just to give me a chance to talk with all my friends and fiends there! We really need to all get together more than just once a year. Although, since I’m fairly sure most people would get sick and tired of me pretty quickly, maybe I should be happy with the one incredible weekend of monster love each fall. I’m thankful for that and very, very pleased to have been a part of it thus far. It was terror-ific to see all you freaks and creeps again, and I lurk forward to my next chance to socialize with you all, be it on this planet or beyond the veil! Excelsior and stomach-turning chunks of love to all you who were so much fun and helped make Mask Mask-Fest 2015 such a great time! Yes, without a doubt MF2015 exceeded all expectations. Already itching for next year. It was fantastic to meet you in person Dr Lady, Mask Fest 2015 came and went all too fast. Speaking with Sandy Collora and his training with the great Henry Alvarez, getting to chat it up with the always friendly Ed Edmunds and asking tips with one of my favorite mask makers - the patient and humble Pete Infelise was a real highlight. Good times with my boys Monte and Casey! It did indeed fly by too quickly (it always does). Next year I'll be coming out on Thursday instead of Friday. I NEED an extra day of Maskfest.